Your love of family and your love of the Houston Astros is unprecedented; why not commemorate both with PersonalizedThings by Exposures? Celebrate this iconic team that plays each season at Minute Maid Park with our unique MLB baseball sports decor. Featuring vibrant, custom-made prints wrapped in MDF vinyl-wrapped frames and protected behind glass, this long-lasting gift is ideal for baseball fans of all ages. 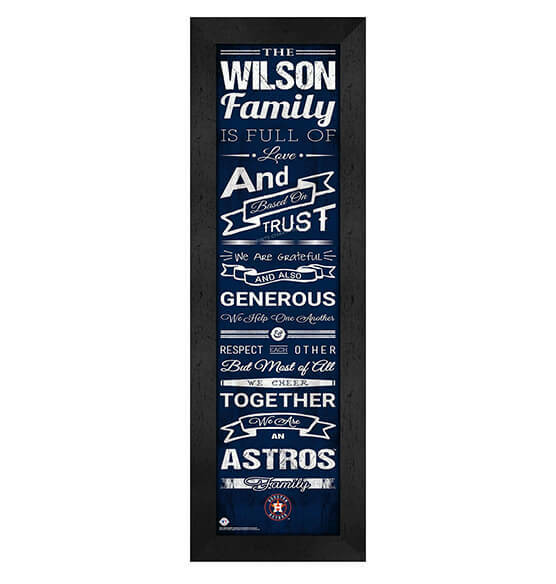 With the Houston Astros logo and team colors, our vertical print includes sweetly special sayings that are sure to warm the heart. Our high-quality piece arrives ready to hang with an included sawtooth hanger.